Even if BBQ Exchange served nothing but barbeque, it would still warrant recognition by The Charlottesville 29. The pulled pork, ribs, chicken, and brisket are among the area’s best. What removes any doubt about BBQ Exchange’s merit is everything beyond the barbeque. To every item on the menu, Chef Craig Hartman brings the attention to detail you might expect from a chef who has cooked for presidents and dignitaries, and spent decades overseeing kitchens of fine dining restaurants. Hartman, who launched the restaurant at Clifton Inn and then Fossett’s at Keswick Hall, is on the Mt. Rushmore of Charlottesville area food. 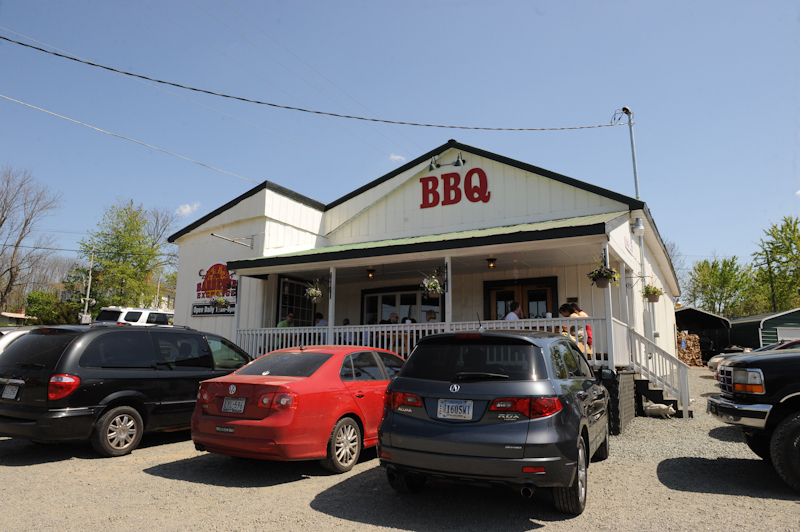 At BBQ Exchange, his stamp is evident not just on the barbequed meats, but also the ten different kinds of house-made pickles, a trio of cabbage slaws, the macaroni and cheese, the pumpkin muffins, and pickle spears fried so well they alone might justify the drive to Gordonsville. BBQ Exchange’s pulled pork is excellent. One of our favorite ways to enjoy it is what you might call “Country Confit.” We take home a container of pork, chop it up very finely, pack it back into the take-out container, and then refrigerate it over night, taking care to include all of the pork grease. (If we are feeling fancy, we might press it into a ramekin.) The next day, we eat it cold, spread onto hunks of a baguette from Albemarle Baking Company. As garnishes, we like BBQ Exchange’s pickles, some cornichons and grainy mustard from Feast, and Jalapeno Jelly from Planet Earth Diversified. We wash it down with a crisp beer from Beer Run or a big glass of a hearty red wine from In Vino Veritas. Below are more of our picks, along with Chef Hartman’s picks, and BBQ Exchange’s appearances in Five Finds on Friday, where chefs and personalities have named a BBQ Exchange dish one of the best in town.